Today I ventured down the Potrero Grade to CSU Channel Islands to run the 3rd Annual Aut2Run 10K in support of the Autism Society of Ventura County. This was my first completed race since the 2nd Annual Aut2Run 10K last year. My training has consisted of daily runs, but nothing fast or fancy, about 30 to 40 miles per week, mostly slow and unfocused. It was fun to get out there today with no set expectations in mind, other than to give it a solid go and try to run a smart race. Last year I finished 3rd overall in 37:55, a time that reflected the fact that I was running with some 11-12 year old kids one day a week on the track. This year I managed a 38:56, which I was happy with given my training and my advanced age (I reached my 2nd half century of life subsequent to running last year's race). In the posted race results, my time shows me at 4th place overall, but behind a 48 year old woman from Moorpark. Unless my advanced age has created senility, I know for 100% fact that that person in front of me in 3rd place was not 48 years old, nor a woman, but perhaps a 24 year old male over six feet tall. I know that quite well as he trailed me for several miles early in the race, before pushing ahead and leaving me in the dust on this part-trail run, though I had him in my sights the remainder of the race. This is a well managed race and STARTED ON TIME. That's always a positive sign when race organizers, who have a challenging job managing any race, can nail that. Although I live only about 5 miles away from the race, I managed to barely drag myself out of bed and down the hill to reach the starting line with about 4 minutes to spare. As the starter said "Go," the standard adrenaline-induced sprint took place, leaving me in about 40th position at the first turn. Having run hundreds of local 5K/10K runs over the years and finishing 3rd place last year, I smiled, knowing, all these sprinters would provide me some target practice over the next few miles. It only took about mile and a half to settle things out, where I landed in about 4th or 5th position for the remainder of the race. This 10K is pretty much flat the entire way, though the 2 miles of dirt surfaces near the Scary Dairy along with a couple short hills provided for very brief challenges. Mile 5 is a very slight downhill on Camarillo Street. I tried to pour it on over that stretch, but when you're not used to running fast, it's hard to do so as you fear your body could implode. I was able to pass a youngster half my age who was running in, yes, a lab coat. I joked with him that he was doing the elderly (i.e. me) a favor running in that coat and that they should deduct a minute of his time for it. He laughed and we pushed on to the finish. The winner of the race was Steve Cox of Newbury Park, who finished in a speedy 36:35. Steve is 18 years younger than me, so I figure, he would run 10 seconds per year slower over those 18 years, or 3 additional minutes, resulting in a 39:35, so I would have beat him, heh heh. Yes, one can become quite delusional once they reach age 50. Nice job, Steve! 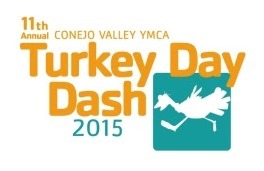 A great race it is and an outstanding resource onsite with a number of autism and special needs organizations. 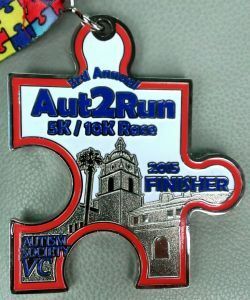 Learn more at www.aut2run.org and the Autism Society Ventura County site at www.autismventura.org. The 30th Annual Great Race of Agoura Hills took place on Saturday, March 28, 2015. I once again did not participate in this event due to my kid's sports activities but thousands of folks participated that day. Nicely done! Next year's 31st Annual event is set for Sunday, March 19, 2016. Visit greatraceofagoura.com to sign up! The 30th Annual ACICS LA Marathon last Sunday, March 15th, took place on a day with unseasonably warm temperatures, some 15 to 20 degrees above normal. But that didn't stop 22,333 runners from crossing the finish line, led by overall winner Daniel Limo of Kenya in 2:10:36 and top female, Ogla Kimaiyo of Kenya in 2:34:10. American runners finished 3rd overall in the race, which also represented the USATF Marathon Championships. Jared Ward finished in 2:12:56 and 39 year old Blake Russell ran a 2:34:57 in the women's race. Liz Camy of Simi Valley was the 18th female and 61st overall finisher in the marathon in 2:46:58! Wow! Here's Liz winning the Surf City Half Marathon in Febuary. More at www.lamarathon.com. They are already taking entries for the 31st edition on Sunday, February 14, 2016. In its second year, the Ventura Marathon and Beach Party reached record numbers, drawing over 3,200 participants from 34 states and nine countries. Overall marathon winners were Dirian Lenin Bonilla who ran a 2:32:34 (5:49 per mile pace) and Bonnie Axman Keating who finished in 2:45:15 (6:18 pace). The men’s half marathon was won by Westlake Village resident Sean Gildea who ran a 1:08:04 (5:12 pace.) The women’s half-marathon title was won by Allison Maxson in 1:15:57 (5:48 pace). The 2014 event raised over $25,000 for local schools and charities including Pier Into The Future, the Humane Society of Ventura County, Autism Society Ventura County, Alex’s Lemonade Stand Foundation for Childhood Cancer, Max Cure Foundation, the Rotary Club of Ventura, and over one dozen local school groups and teams. Race director Josh Spiker was particularly excited about the event's support of local charities and programs and gives thanks to the over 700 volunteers that made the event such a success. The flat and fast course took runners and walkers through the cities of Ventura, Oxnard and Port Hueneme before culminating at the beachfront finish of the historic Ventura Pier. The event included a full two-day beach party which featured over 60 vendors, food trucks, a beer garden by Firestone, seven live bands and various kids’ activities. 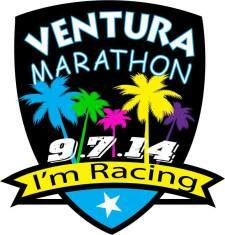 For more info or to check on updates about next year’s event, go to VenturaMarathon.com. The event is managed by Vendurance Sports, a Ventura County-based running club and event management company aiming to bring high-quality, well-organized and affordable events to the region.